My grandmother never used to speak much about her father, Joseph Fleury and what she did say wasn't very complementary. Whether this was from direct experience or whether her view of her father was, at least, in part influenced by her mother, Beatrice, is not clear. The impression was that after a certain point in time he no longer lived with his family and indeed one of my grandmother's favourite stories was about the time when he called round and she chased him away with a frying pan. When she was small she was also told by her mother not to speak to her father if he showed up at the school. Her teachers were under instructions to send him away should he make an appearance. One could be forgiven for thinking that Joseph Fleury was a thoroughly disreputable character. However, when one takes a closer look at his army record, a different picture emerges of a man, who had low self esteem, was occasionally suicidal, possibly suffered an identity crisis and was often in poor health. In short Joseph Fleury probably needed help and support rather than abuse. The fact that he appears to have received it neither from his family or his employers certainly can not have helped his well-being. We know little about Joseph's childhood other than he would appear to have been moved a couple of times from Manchester to Sunderland and back. He also grew up living with his grandparents and, as a youth, carried the surname Mokone or similar. 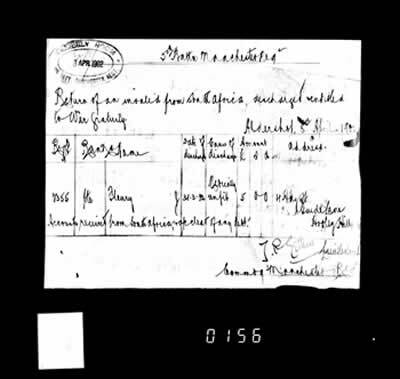 Joseph joined the Manchester Regiment as a private no. 2355 on 29 September 1888 just before his 18th birthday (his army records suggest he was born around 17th October 1870). 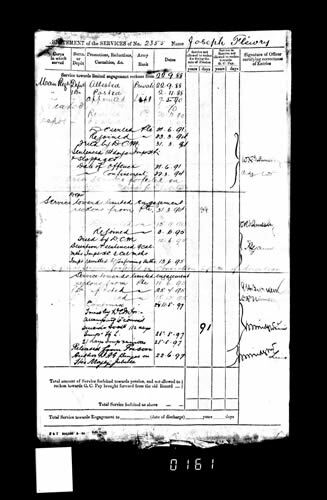 He can not have spent a very happy time in the army because he deserted twice, once on June 22nd 1891 (owing 1 pound, 11 shillings and fivepence), which cost him 84 days imprisonment when he eventually rejoined on 23rd March 1894, and a second time on 15 September 1894. He served in India during 1895 but then, on 11 May 1897 he tried to commit suicide. He was sentenced to 112 days in prison on 25 May that year but was released on 26 June in recognition of Queen Victoria's Jubilee. From March 1900 until 1902 he served in the Boer War in South Africa but was sent home as an invalid in March 1902. Joseph's personal relationships were equally chaotic. 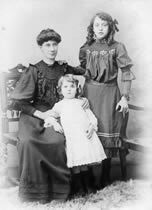 At some point around 1895 he met Beatrice Dunston and had a child, Annie, out of wedlock with her (Beatrice is pictured, right, with Annie and Gladys). However, whilst he was away in South Africa Beatrice had an affair with Jim Hurley, in whose house her brother Richard was lodging, and a second child, May was born. What happens after that is fairly unclear. Joseph married Beatrice one month after his return in April 1902 and my grandmother Gladys Fleury was born almost exactly 9 months later. However, when Joseph and Beatrice's relationship broke down and why is not known. It would appear that Joseph then worked as a general labourer up until the outbreak of the Great War in 1914, when he volunteered for service. In his 1915 medical Joseph is described as being 5ft 4 ¾ , 112 lbs, with a 35 ½ inch girth with 3 ins range of expansion. His physical development and pulse rate (74) were described as good. His eyes were blue and his hair was described in his early army career as being "sandy" but by 1917 it was brown, starting to go grey. His religion is described as "Wesleyan" . Joseph enlisted in the reserve on 8 September 1914 but was discharged in March 1915 as "not likely to become an efficient soldier". A key reason for this was his lack of teeth. He had previously had plates fitted. However, his medical report states that his lower jaw had become so atrophied that it was impossible to get the plate to stay in position. Joseph was enlisted in the reserve again in 1916, this time in the Lincolnshire Regiment but was discharged in Lichfield on 13th September 1917 due to unfitness, described as being "not the result of but aggravated by military service". Joseph died of tuberculosis in August 1920.